The MLS Player’s Union released 2018 salary information for every player across the league on Thursday. To be fare to Simpson, he doesn’t choose the lineup. I don’t think anyone could make a convincing case the Simpson would or could be any worse than what we have going on right now at Striker. Chief, I don’t disagree, but people act like Simpson deliberately came here to sit on a bench and get overpaid. Again, he was the opening day starter last season until he punctured his lung. 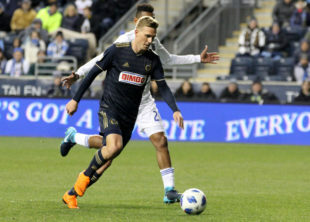 CJ earned his time, but tell me this: Why is CJ allowed to go for months with poor scoring tallies, but Simpson gets a half in an Open Cup game, fails to score and is promptly buried in the depth chart. I don’t think Curtin knows how to use his best weapons. He manages system first, rather than finding the best system for the tools he has. Erines Stewart WINS LOSSES AND TIES as of this date………..,Ernie Started his Job for the Union in 2016…….His job was announced in October 2015. I am putting all decisions on player roster decisions on him as of that date.. He came to Philly with reputation of putting together winning teams and spending ” money wisely”. Could have kept Barnetta here at least 2 more years with a good salary increase. This was the teams biggest loss. Putting this one on Sugarman also. Not Keeping LE Toux. I realize he was not producing what he did in his first few years but you took away the face of this franchise. Roland Alberg signed him could not figure how best to use him then realized his worth as a goal score in game situations released him and never signed antother player with his qualities. Harris M gave the team some nice assists and direct kicks in the past but he has no legs at all now. Ilisnio only current player with the moves the wisdom and playmaking ability on the team, Just a ahame it is packaged in a 35+ year old aging injury prone body. Well there you go. That puts Ernie at…… O wins ….6 losses and 4 ties come to think of it …Sounds a lot liketheir current record……. and I think I was being generous. What do you think? Jack Elliot, Bedoya, Ilsinho, Trusty (thus far) are Wins. Roland Alberg scored goals on a team that can’t score goals…. Tie (at least). Simpson. One MLS start. One Goal. Tie. the greater point to my response? Having him for ZERO wins is disingenuous. Dockal is on loan. Is the Union paying that whole salary? My guess is that China is paying a good part of that salary. If the Union are paying the whole ticket, it’s an appalling signing. And would be exhibit A1 in an indictment of Stewart. I’m not calling it a failure. It’s an outrageous salary for a 30+-year-old midfielder. He costs nearly twice what a proven US player (e.g.Lee Nguyen) costs. Stewart was billed as a money ball player. This is as far away from money ball as you could get. This is a Sakiewicz signing. We’re paying more than $3.5 million for this midfield. Are you kidding me? i can’t put it all on ES. these three midfielders players have talent and have pedigrees. where is Curtin in all of this? since i cant name a single good thing Curtin has brought out of this team with his tactics, EVER, I am much more likely to believe Curtin simply doesnt know how to use his pieces. He’s actually under 30 not 30+, but I agree the salaries are messed up. I gotta figure if we had just thrown that money at the Revs back in Jan. we could have convinced Freidel to sell even though it’s the same conference. Lee is really exactly what we needed, would have had a full preseason and slotted right in. Stewart (and certainly Albright) have not figured out MLS yet. Ordinarily I remind people that foreign transfers often take a long time to adapt to MLS — the physicality, the travel, the culture, etc. Except A) Somehow the Central and South American signings for teams like Atlanta don’t seem to have any such problems; and B) Dockal has been so incredibly bad that I’m not sure he has any excuses. I mean, we’re talking about ONE match out of seven in which he’s been a positive at all. atlanta has tata martino. apples. oranges. grenades. $1.345 million per goal so far from the top 5. Over the course of the full season? About $560,000 per goal. Oh, same numbers for assists since the top 5 only have 4 of these as well. Moneyball indeed Earnie, moneyball indeed. What is going on with the entire organization? Everything is just so wrong right now. Caveat is that this is base and guaranteed. I do not believe it includes performance-based bonuses. So, for example, Gaddis may make more base salary but Rosenberry may bring home more at the end of the season for hitting any appearance/starts/minutes bonuses since he is the starter. boy why would a player ever choose MLS over UNC for $80,000 or $54,000. My heavens…. well at least Don Garber makes $12,000,000 a year.